Hard Carrying Case and Reagents for 100 Tests Included! 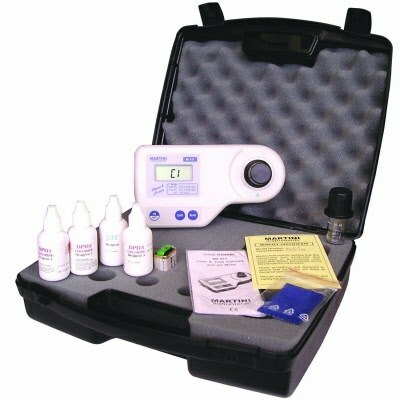 Range: 0.00 to 5.00 mg/L of Cl2 (Free & Total), accuracy: ± 0.04 mg/L at 1.50 mg/L; range: 5.00 to 9.00 pH, accuracy: ± 0.01 pH. Supplied in hard carrying case including 2 cuvets, reagents, wiping tissue and instruction manual. Milwaukee Instruments has introduced four colorimeters / photometers for measuring free and total chlorine, the Mi404, Mi406, Mi411, and the Mi413 to their colorimeter range. Free chlorine refers to both hypochlorous acid (HOCI) and the hypochlorite (OCI) ion or bleach, and is commonly added to water systems for disinfection. When ammonia or organic nitrogen is also present, chloramines known as monochloramine, dichloramine and trichloramine will quickly form. Chloramines are also known as combined chlorine. Total chlorine is the sum of free chlorine and combined chlorine. The level of total chlorine will always be higher than or equal to the level of free chlorine. Free chlorine is typically measured in drinking water disinfection systems. Total chlorine is measured to determine the total chlorine content of treated wastewater for discharge purposes. Chloramine is harmful for aquatic life and damages water treatment plants that use membranes for water purification. It is important to monitor the levels of free and/or total chlorine on a regular basis. Both these forms of chlorine can exist at the same time but should be measured separately. The Mi411 measures free and total chlorine with pH, and the Mi404, Mi406 and the Mi413 measure free and total chlorine, free chlorine and free and total chlorine HR. The colorimeters are supplied complete with 2 X Cuvets, reagents for 100 tests, hard carry case, wiping tissue, 9V battery and instructions.